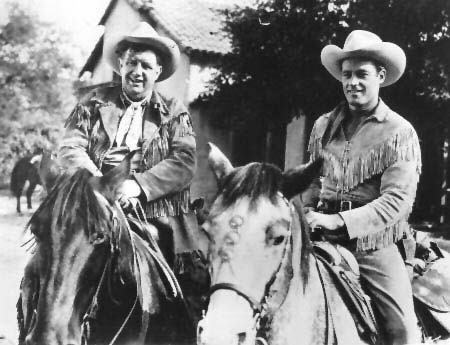 This western featured movie star Guy Madison as the lead, ably assisted by media veteran Andy Devine as his sidekick Jingles. Both remained with the series for its entire run. Kellogg's was the sponsor from start to finish. After the last show in December 1954 it went into syndication from July 1955 until Feb 1956. Guy Madison and Andy Devine were extremely busy during this time. In addition to the radio series they also appeared in 113 half hour TV Wild Bill Hickok shows between 1951 and 1958. Unlike most series that made the transition from radio to TV, The Adventures of Wild Bill Hickok TV Show kept the same cast as the radio show. The TV version began as a syndicated one; it was picked up by CBS-TV and viewed from 1955-1958 and on ABC-TV from 1957 to 1958 in the day time or late afternoon. Even that it was directed at a juvenile audience, the shows are quiet entertaining for all age groups. Jingles' horse was named "Joker" and "Buckshot" was ridden by Wild Bill Hickok.